Blowing vapor out of your mouth and nose like a dragon? How cool is that? Minus 50-60 degrees Fahrenheit to be exact. 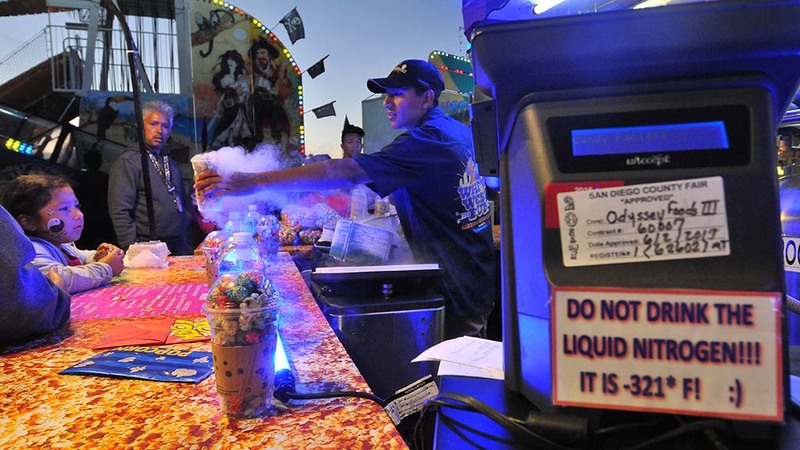 Nitro Pop, nitrogen-infused candied popcorn, is one of the more magical new things at the San Diego County Fair. The popcorn — food and entertainment in every kernel — is appropriately in the Kid Zone. The sight of vapor escaping mouths, noses and reportedly ears is making its way onto social media. 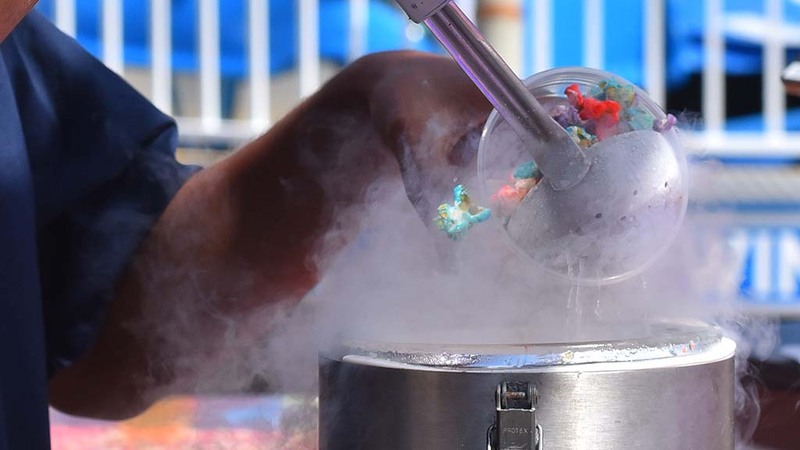 Nitro Pop is a mixture of cherry, strawberry, grape, blueberry, raspberry and vanilla-flavored popcorn immersed in liquid nitrogen and then drained into a 16-ounce cup, says Dominic Palmieri, owner of the Phoenix-based operation, called Candy Factory at the fair. “It’s funny to watch grown adults just become kids again though this experience of food,” he told Times of San Diego. 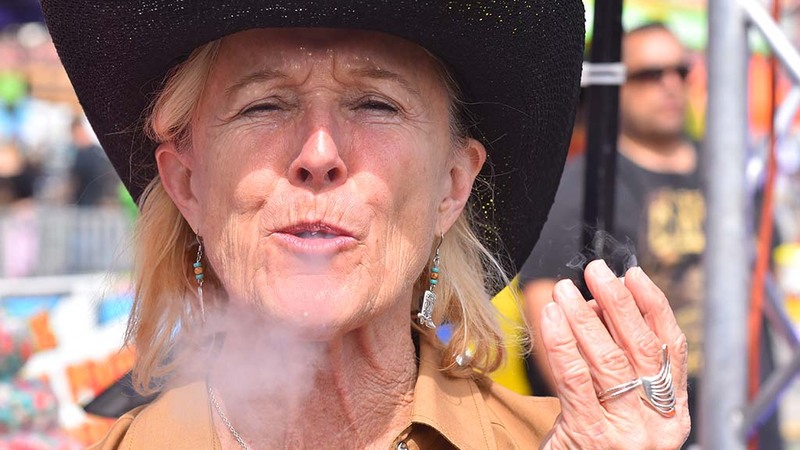 “I call it the interactive food of the San Diego County Fair,” Palmieri said as friends and family members begin taking photos and video of the smoky action. Chemist Anne Marie Helmenstine says the ingredient is safe. Palmieri says his “creative team” is always looking for innovative food and became aware of the popularity of ice cream shops using liquid nitrogen to make the sweet before people’s eyes. 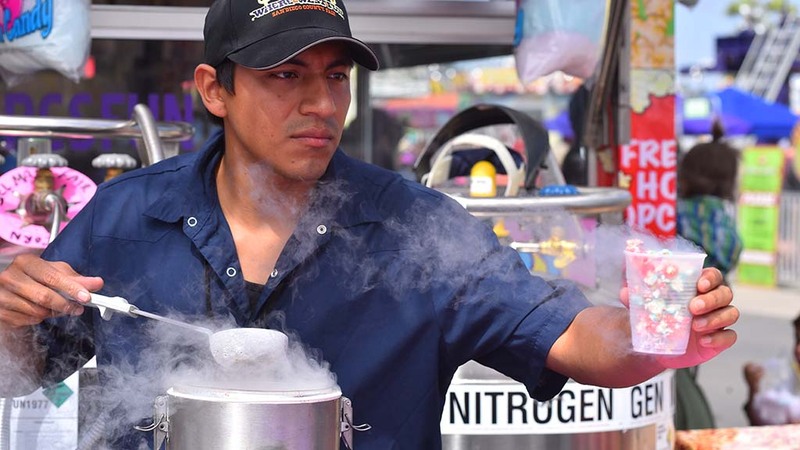 Nitro Pop — unrelated to a Los Angeles catering service called Nitro-Pop — debuted in February at the Houston Livestock Fair and Rodeo, and has since won several awards, including first place for “most creative food” at the Gold Buckle Foodie Awards, under the name Cowboy Carmel Corn. 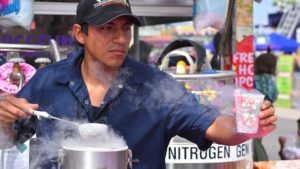 His employees take precautions not to inhale liquid nitrogen, but because it’s a food- grade nitrogen, “there’s no side effects or anything,” Palmieri said. By the time it’s eaten, the nitrogen has warmed from minus 320 degrees to about 50-60 below zero. Palmieri says he sells a couple hundred orders daily at the fair. 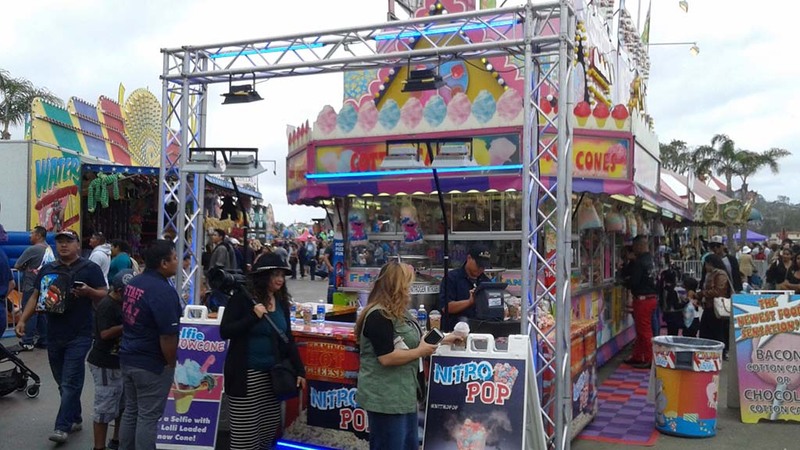 Previously in Tucson, he’ll move his booths to the Orange County Fair in Costa Mesa, L.A. County Fair in Pomona in September and the Arizona State Fair in Phoenix in October. While boasting the “coolest” food at the fair, he also lays claim to the “hottest” food. 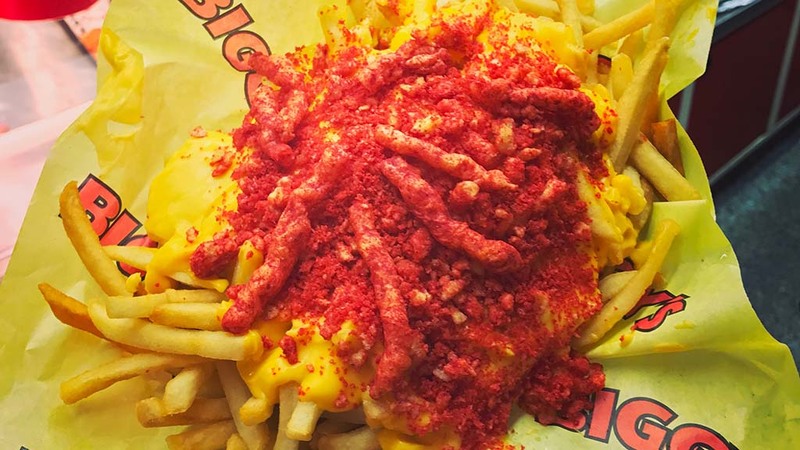 At his Biggy’s booth in Plaza de Mexico, Palmieri introduced his Flaming Hot Cheetos Cheese Fries.